In this July 29, 2018, photo, rookie Democratic candidate Lauren Underwood greets supporters at the opening of her campaign office in St. Charles, Ill., 100 days before the midterm election. The 31-year-old nurse, who also worked in the Obama administration Health and Human Services Department, says she hadn't really considering running for office...but then, she heard that the Democratic Congressional Campaign Committee was digging into the numbers to see where they might be able to compete in 2018. "I was like, 'What? I want to know about the data on Democrats in Naperville.' So I reached out and they brought me in for a meeting and walked me through that information," she said. "At the end of that conversation they were like, 'We're looking for someone to run in the 14th. Is there any chance you'd be remotely interested?' That opened the door for me." That fact — that she only really started thinking seriously about running after she was asked — makes her a lot like many other women candidates. But since the number of women candidates for House, Senate, governorships and state legislatures have all soared past previous records this year, raising the question of whether the conventional wisdom that women don't step forward to run on their own is changing. "What we do know is that women don't think about running for office as often as men do without getting recruited, without having someone else suggest it," said Deborah Walsh, director of Rutgers University's Center for American Women and Politics. "We don't know if this is a one-off or if this may be the beginning of a new norm. But it's fascinating to watch women who are not necessarily waiting to be asked, not waiting to be asked to the dance," she said. "They're just stepping up and engaging as candidates." Elizabeth Heng, a Republican running in California's 16th district, is one such candidate. "It was all me," she says of her decision to run earlier this year, spurred by evidence of a dysfunctional Congress. "On January 20th, when our government shut down again, something about that day just lit a fire under me." Political scientists are at the very start of understanding how much this year changed things — whether it kicked off a new era of more self-motivated candidates like Heng. In May 2017, Loyola Marymount University's Richard Fox and American University's Jennifer Lawless put together a survey of more than 2000 college-educated, working adults — people they considered "potential candidates" for office. "I would say that general conventional wisdom is probably still true," Fox said. "Women are still less likely to sort of think of running, you know, simply and easily, 'Oh that's something I might like to do someday' — have it in their consciousness." All of that said, he sees at least one potential sign of change. Among that relatively small group of people who said they had considered running for office, Democratic women were much more likely than other groups to say they first started thinking about running since Donald Trump was elected. And, indeed, Democrats account for around 3 in 4 women House candidates this year. "There is a group of women, a small group of women, who are very activated by Trump's election. So then the conventional wisdom wouldn't apply to them," he said. "So when the first person comes by or suggests, 'Hey, you should come to this candidate training,' they're in quickly." The explosion in Democratic women's energy does cement one longer-standing trend, Fox said: that of a growing difference between the number of women Democrats and the number of women Republicans. "I do actually think the party divergence has gotten much, much bigger," he said. "In our earlier research in 2001 and 2010, where we surveyed thousands of potential candidates the gender gap between Democrats and Republicans and men and women in terms of ambition was the same. It's now it's actually quite a bit smaller among Democrats." That gulf between the parties' gender gaps has only widened this year. Still, perhaps the bigger question is whether this year's bump in the total number of women candidates is a blip, or whether it is a sign of more energized women in future elections. One place to look for comparison is 1992, the so-called "year of the woman." Democratic women in particular were galvanized that year, after watching a panel made up entirely of white men grill Anita Hill over her sexual harassment allegations against then-Supreme Court nominee Clarence Thomas (who went on to be confirmed). As a result of that election, the number of women in Congress climbed by two-thirds. "Unfortunately, in 1992, we didn't see lasting change," Walsh said. While the numbers of women elected to federal and state office climbed sharply that year, Walsh says, those numbers slowed or even stagnated in the following years. Still, she's hopeful that this year will be different. "It feels like this moment is different — that there is potential for this to be more than a one-off, that the momentum and the energy behind these women running feels like it has the potential to last — you know, to have some legs," she said. One thing Walsh cautions against is overstating how big this year's wave is. For one thing, a large share of women candidates are challenging incumbents — an uphill battle in most districts. In addition, while the number of women running is by far record-setting, men came out in droves, too. "Let's keep in mind that women made up only less than a quarter of the congressional candidates this cycle who filed," she said. "Women are still underrepresented as candidates." Not only that, but many of those women who are running are challengers, facing the formidable task of trying to unseat incumbents. If women House candidates win all of the races they're favored to win, plus races they are competing in currently seen as toss-ups, they will go from making up 1 in 5 members of the House to 1 in 4. But women make up more than half of Americans. Which is to say, there's plenty of room to grow in the future. Editor's note: NPR is examining the role of women in the 2018 midterm elections all week. To follow more coverage and look back at how the role of women in the 2014 midterms was covered, click here. A record number of women are running for Congress this year. NPR's Danielle Kurtzleben asked if this marks a lasting shift. DANIELLE KURTZLEBEN, BYLINE: Lauren Underwood, the Democratic House candidate in Illinois' 14th district, is relaxing with a drink after an afternoon of greeting constituents at a picnic in Geneva, Ill.
LAUREN UNDERWOOD: I just want the people of America to know that this is 100 percent juice Capri Sun. KURTZLEBEN: The 31-year-old nurse, who also worked in the Obama Health and Human Services Department, says she hadn't really considered running for office. But then she heard that the Democratic Congressional Campaign Committee was digging into the numbers to see where they might be able to compete in 2018. UNDERWOOD: I was like, what? I want to know about the data on Democrats in Naperville, so I reached out, and they brought me in for a meeting and walked me through that information. And at the end of that conversation, they were like, we're looking for someone to run the 14th. Is there any chance you'd be remotely interested? That opened the door for me. KURTZLEBEN: And that makes her a lot like many other women candidates, says Deborah Walsh, director of the Center for American Women and Politics at Rutgers University. DEBORAH WALSH: Women don't think about running for office as often as men do without getting recruited, without having someone else suggest it. KURTZLEBEN: But then women are interested in running this year - far more than any year in history - and they've been winning. 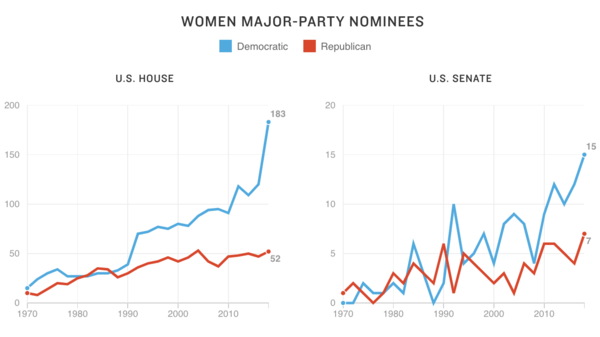 The number of women nominees for House, Senate, governorships and state legislatures have all soared past previous records this year. Political scientists like Walsh are wondering - could the conventional wisdom be changing? WALSH: We don't know if this is a one-off or if this may be the beginning of a new norm. But it's fascinating to watch women who are not necessarily waiting to be asked - right? - not waiting to be asked to the dance. They're just stepping up and engaging as candidates. KURTZLEBEN: Elizabeth Heng, a Republican running in California's 16th district, decided to jump in just earlier this year. ELIZABETH HENG: It was all me. On January 20, when our government shut down again, something about that day just lit a fire under me, right. KURTZLEBEN: Political scientists are at the very start of understanding how much this year changed things. In May 2017, Loyola Marymount University's Richard Fox and fellow political scientist Jennifer Lawless put together a survey of more than 2,000 college-educated working adults, people they considered potential candidates for office. RICHARD FOX: I would say the general conventional wisdom is probably still true. Women are still less likely to think of running, you know, simply and easily - oh, that's something I might like to do some day, have it in their consciousness. KURTZLEBEN: However, he sees at least one potential sign of change. Among that relatively small group of people who said they had considered running, Democratic women were much more likely than other groups to say they first started thinking about running after Donald Trump got elected. And indeed, Democrats account for roughly 3 in 4 women House candidates this year. FOX: There is a group of women who are very activated by Trump's election, and, you know, so then the conventional wisdom wouldn't apply to them. KURTZLEBEN: The question is whether this year's bump will hold. One place to look for comparison is 1992, the so-called year of the woman after which the number of women in Congress climbed by two-thirds. WALSH: Unfortunately, in 1992, we didn't see lasting change. KURTZLEBEN: Deborah Walsh says that while the numbers of women elected to federal and state office climbed sharply that year, those numbers slowed or even stagnated in the following years. She's hopeful that this year will be different. WALSH: The momentum and the energy feels like it has the potential to last, you know, to have some legs. KURTZLEBEN: One thing Walsh cautions against is overstating how big this year's wave is. For one thing, many of the women who are running are challenging incumbents. Plus, men came out in droves, too. WALSH: Women made up, you know, less than a quarter of the congressional candidates this cycle who filed. Women are still underrepresented as candidates. KURTZLEBEN: If women House candidates win all of the races they're favored to win, plus all of their toss-up races, the number of women in the U.S. House will go up from 1 in 5 to nearly 1 in 4. But women make up more than half of Americans, which is to say there's plenty of room to grow in the future. Danielle Kurtzleben, NPR News, Washington. Transcript provided by NPR, Copyright NPR.